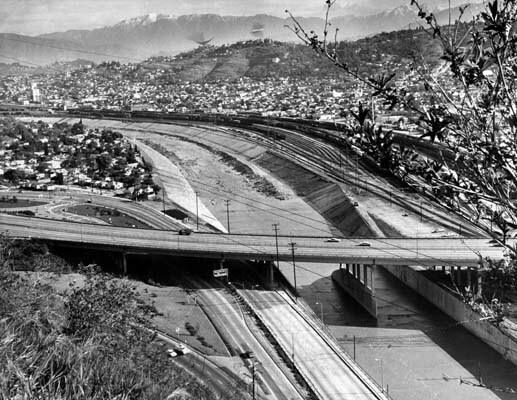 Some of these historical photographs show the Los Angeles River before the riverbed was concreted. Located on along each side of the river were the railroads of Southern Pacific, Santa Fe and the Union Pacific. All three railroads spent considerable time and money to dump fill along the banks of the river, this to keep it from washing away their tracks. So far, so good. But in time the river will win back its meandering way. 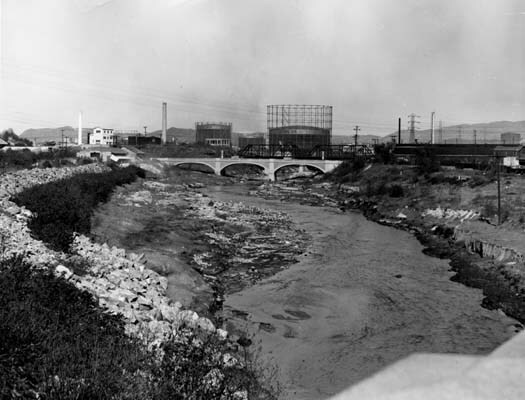 The Los Angeles River before concrete. 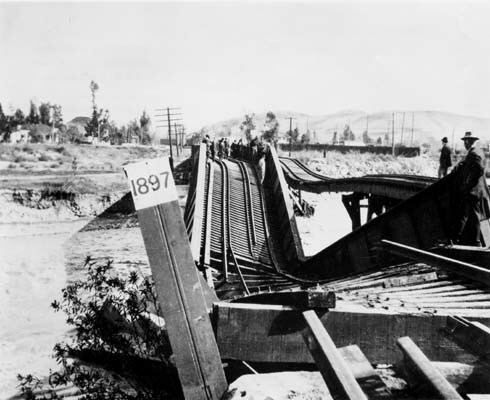 An 1897 railroad bridge over the Los Angeles River was destroyed by a flood in 1914. 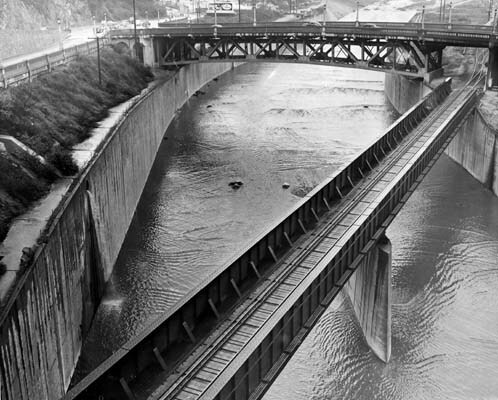 Taylor yard at the south end at the Los Angeles River at the narrows. Southern Pacifics First Crossing bridge looking towards the Midway Yard. This bridge has been replaced by Metro-Link as a double track bridge. 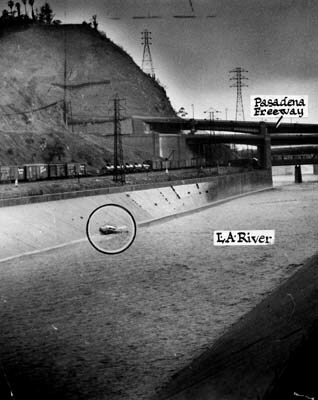 Here a car has plunged into the Los Angeles River from the Pasadena Freeway Bridge. Stupid thing for the driver to do, but this is a great picture of Southern Pacific’s Midway Yard. 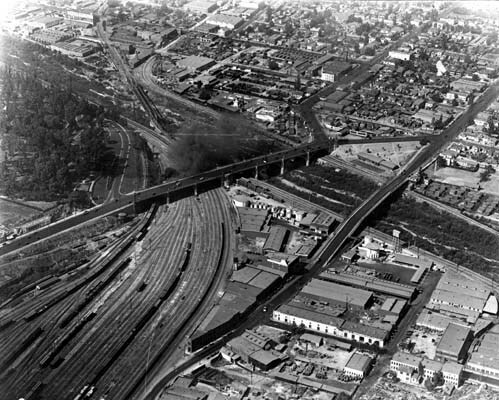 Southern Pacific’s East Bank Line built in 1924 is on the left, Midway Yard is to the right of the picture. The Santa Fe Second District bridge is seen in the distant. 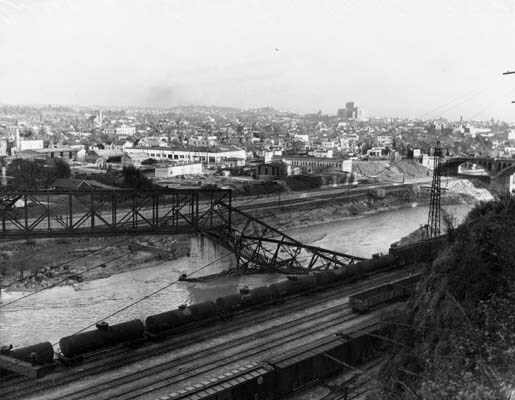 The Santa Fe’s Second District bridge was damaged in 1930 flood, Midway Yard is seen at bottom of the picture. 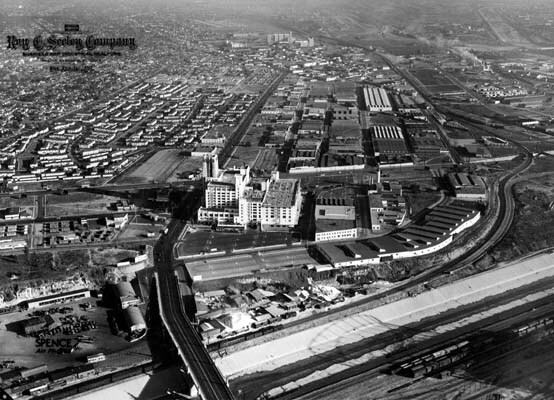 View of the west end of the Southern Pacific River Station Yard connecting to Midway Yard, the Broadway Bridge cross between these two yards. 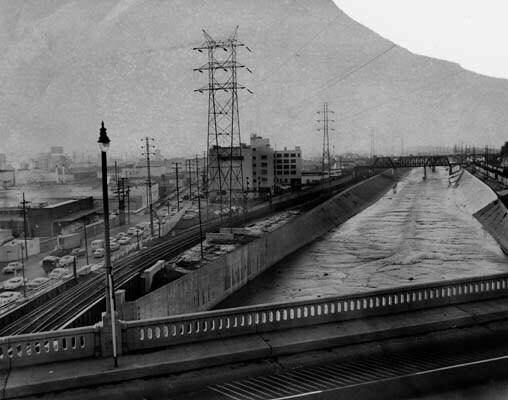 Union Pacific tracks curve eastward away from Los Angeles River, Santa Fe Railroad yard in foreground.